Mouse control - just move left to right to position Carrie under the falling shopping items. You're an officer working for the government. There is a riot and it's out of control, so you're their enemy. Run for you life! Warp through portals to the goal! 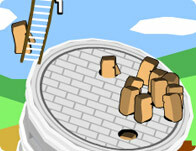 Use your surroundings and gravity to move through gateways and beat each level by par. Aim carefully and strategically!